This is a great portable illusion for children's shows, small enough to be used in a living room setting and large enough to be presented on a stage in a school auditorium. 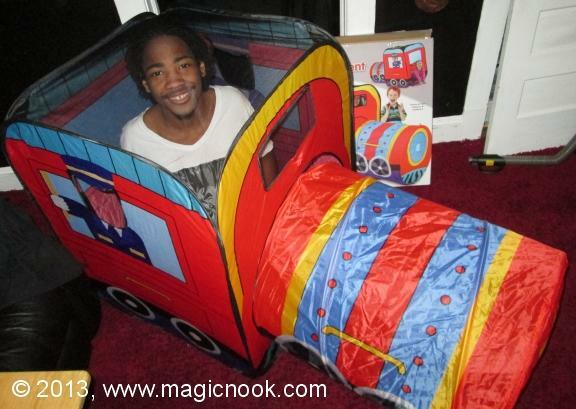 It makes use of a commercial "Locomotive Play Tent" that sells for $20 - $40 depending on the source (Wiz Kid Qua-Fiki bought his from Amazon.com). Then you have to do a little work on it to "magicify" it and turn it into an illusion that will make one or more children appear inside it. It makes a good child participation illusion, and the best feature is that it folds up into a little carry bag for easy transportation. Most experienced magicians will know exactly what to do with this when they see it, but for those who need help with the conversion and performance aspects, you can find the e-Book in Jim Gerrish's Kid Magic Section. You can find sources for buying the Train Tent by searching on the Internet.